Does the overcomplexity of Google AdWords cause you heartburn? Data feeds, dynamic remarketing, product listing ads. It can all get overwhelming…and expensive…fast. Yes, there are common best practices, but when it comes to applying them to your specific business seeing them in action can help you understand the big picture. Today, I’m not going to show you which buttons to click in AdWords. Instead, I’m going to share with you the specific strategies and tactics that I used to get my client a 1,550.85% increase in ROI. The chart itself is not impressive. I didn’t increase traffic. I increased campaign profitability. Cut their cost in half. 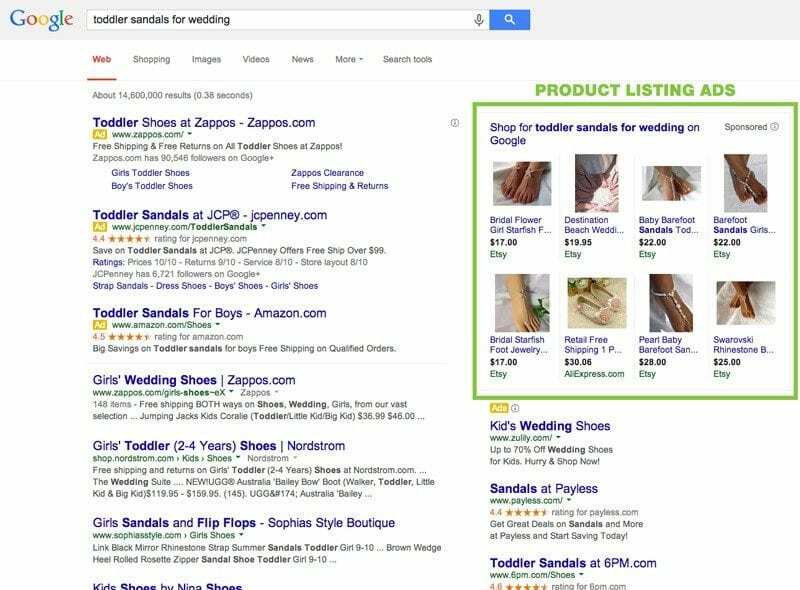 Google Shopping campaigns is a new way to manage product listing ads (PLAs) in AdWords. When someone searches for a product on Google, image ads are displayed right on the SERP. PLA’s are driven by a data feed that contain product information, SKUs, manufacturers part numbers, photos and more. Your product listing ads are only as good as your data feed. Keep reading and I’ll show you what makes a good data feed. Product listing ads generate a 22% higher click through rate than normal ads. Product listing results are determined by your bid, keywords in your product title/description and how they line up with Google’s predetermined categories, known as ‘Google product category’. If at all possible, you should categorize your product to the lowest, most relevant Google category. I also add in my own ‘product type’ attribute. Learn more about Google shopping categories. Include all required data such as unique identifiers. Update your data feed regularly. Exclude out of stock items from your data feed. Submit high quality product images on white backgrounds. Ensure pricing, availability, and description is consistent between your website and data feed. Create user-friendly, keyword rich (not stuffed) product title and descriptions. Keep product titles to 50 characters to avoid characters getting cut off. Include keywords in your data feed categories, product type and custom attributes. Product photos are a vital part of your ecommerce site and data feed. 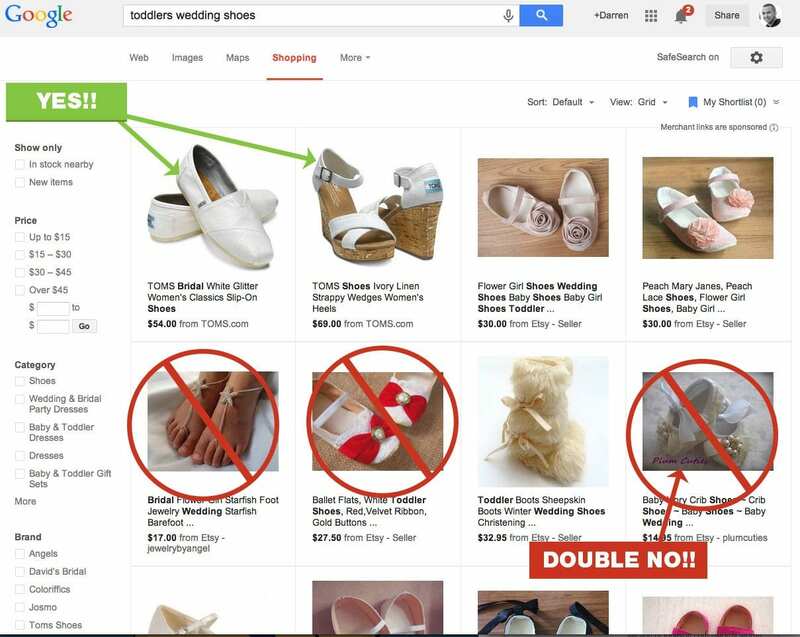 Google is going to crack down on poor images in shopping results. Busy backgrounds, watermarks and logos are a no-no. PPC Pro-Tip: TOMS should use negative keywords to keep their women shoes from showing up for “toddler” shoe searches. If you have a lot of products (300+) like my client, it is going to be impossible to update your data feed stock information manually – every day. If you are in the same situation, you will need to have a developer set up a data feed API. For more tips on data feed optimization check out this post. With Google Shopping campaigns you can group your products into categories, custom product types, brands, or even set custom variables. If you are trying to promote a specific brand, product category (or both) you can group them together and set a bid for the entire group. Bid aggressively on profitable products and bid a few pennies (if that) on low margin products. +Nicole Premo is a big proponent of organizing campaign strategy by product type. I took her advice and it helped to get my client a 1,550.85% increase in ROI. The more detailed you set up your data feed/product categories the more granular your bidding can be. When setting your bids for your most profitable products the goal should be to maximize impression share. You want your products to be listed in the shopping results as much as possible. An impression share of 60% for your most profitable products means that it is only getting listed 60% of the time for relevant searches. This is a sign that you should increase your bid and/or update your product title and description. Bid and budget based on retail value. Bid higher to maximize impression share on high-margin products. 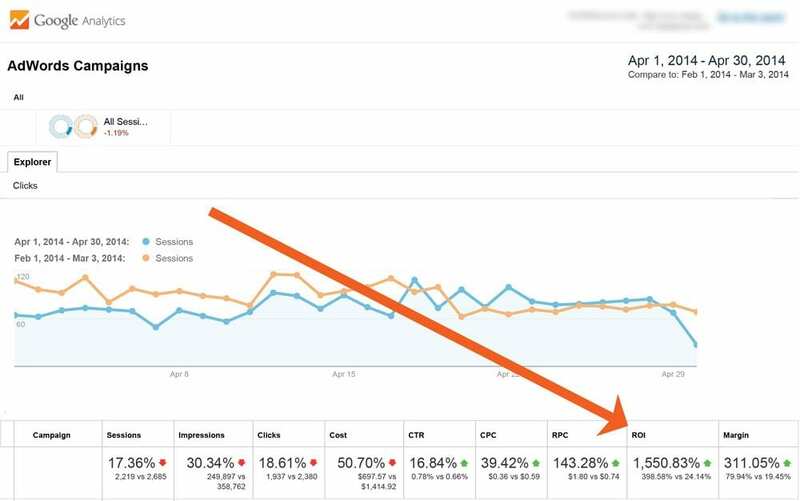 Compare your Click-Through-Rate (CTR) and Max CPC to industry benchmarks to adjust your campaign. I’m a huge fan of display remarketing for ecommerce sites. It is a killer tactic to build your brand and drives an insane amount of ROI. To compete against ecommerce giants like Amazon you need to build a niche brand. Remarketing banner ads on Google’s display network is a tremendous way to improve brand recognition. Remarketing banner ads only show to people that have visited your site (or specific pages on your site). And you only pay when they click on your ad. Because you’re only showing the ads to past visitors, there is good chance that they were already interested in one of your products. Familiarity breeds confidence. This is the kind of high converting traffic that every ecommerce site needs. Don’t get too crazy with it. Just pick a few high-margin products, and drive traffic to those product pages. Create a remarketing list specific to your product promotion strategy. To get the initial wave of traffic to remarket to, I promoted a giveaway on social media, email marketing and forums. Word spread, people came to the page and entered the contest. Then they started seeing banners for that specific product when they were surfing the web. After we announced the winner, the remarketing banners were still floating around, driving product sales. Add the remarketing tag to your Google Analytics tracking code. Look at ad CTR benchmarks by industry and size before you design your banner. Use SEO, Social Media and contests to drive new visitors to your site. Remarket alternate categories or products to people who have recently purchased – or exclude them from your remarketing list. For more aggressive budgets consider Dynamic Remarketing, where ads are created on the fly. Use SEMRush’s display tool to spy on your competitors display ads. Google Shopping and remarketing should not be a money pit. If your ROI is lacking take a step back and eliminate advertising products with low margin. If your product mix is too complicated, getting ROI will be even more complicated. It’s better to market a few products to a high level than a bunch of products at a low level. Take advantage of the simplicity of Google Shopping and focus on making a small campaign profitable. Excellent presentation, and solid advice given. Especially since normal PLA’s are going away August 1, 2014, it’s time to revisit your Google PLA/ Shopping Campaigns. Congrats on your results, and Love a case study with Massive ROI Improvements!! Your very welcome! I hope there is enough information, links to resources to get you started! Darren – Any thoughts on how long descriptions to be. Is too long hurting things? For product titles, Google recommends keeping them at 50 characters. Or at least putting a compete idea /thought in the first 50 characters. Most product listing ads titles are cut off. I usually keep the product titles short, have the SEO title a little longer, then I use a longer meta description as the product description. Some people will balk at the long meta description, but its working for me. Alternatively you can pull the content and use that in the data feed. The link below is from an older post, I reached out to Rudd Hein and he says it is still valid. Great article, a pleasure reading it. Reading all the replies, which are on point. I however want to mention my personal experience and would suggest to have a title length of between 60 and 80. Google has a very high ranking factor on the title, while the description has nearly no effect. So having only 50 characters vs 60 to 80 where you use better keyword management will increase your ranking. Tested with plenty of clients and all have great effect. Thanks, Emmanuel. It does look like the Google shopping product titles get cut off after 65 characters. Why do you think 60-80 is giving you better ranking positions with PLAS? Thanks for dropping by, Molly!! Whilst the roi increase is impressive, it has come from a very low starting point but personally i think it is still fairly poor roi for a shopping ad. It sounds like you know your stuff! Im sure you know the process of optimization is iterative. Rather than dumping more money into it or stopping it altogether, you have to get it on track ASAP. Id love to know what type of ROI you are getting with Google Shopping.